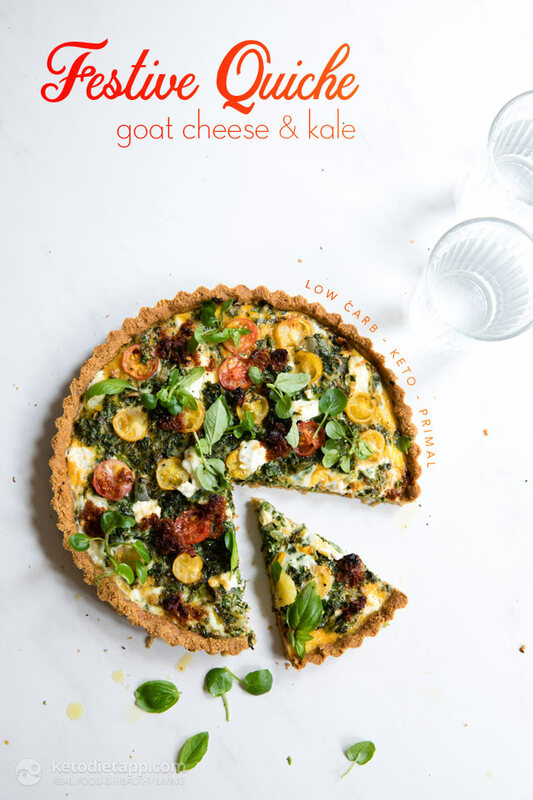 There’s nothing quite as enjoyable as a good quiche and this keto Festive Goat Cheese & Kale Quiche is as tasty as they come. The pastry, so buttery and light, it’d fool any grain eater into thinking it was the real deal! It’s one of those go to recipes you’ll revisit time and time again. Great for the Holiday season just or a lazy brunch. 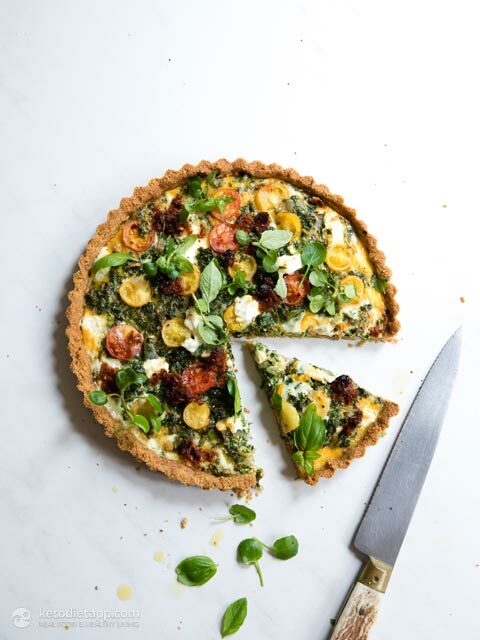 Or why not make on a Sunday and keep in the fridge to use for lunches in the week? Stores well for up to 4 days in the fridge and freezes really well too. Preheat the oven to 180 °C/ 355 °F (fan assisted). Make the savoury pie crust as per this recipe here. Blitz the kale in a high speed food processor until fine. Option to simply chop fine if you prefer. Peel and finely dice the onion. Heat 1 tablespoon of olive oil in a pan. Add the onion and gently fry on a medium/ low heat for about 2 minutes until soft. Peel and finely chop the garlic. Add the kale and garlic to the onion and sauté for a further 1 - 2 minutes on the same heat until wilted. Remove from the heat. 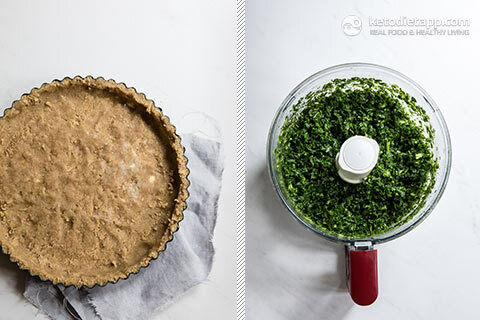 Add 2 tablespoons of the marinara or red pesto sauce to the bottom of the quiche crust and spread evenly across the bottom. Add the kale, onion and garlic mix and spread to the edges. 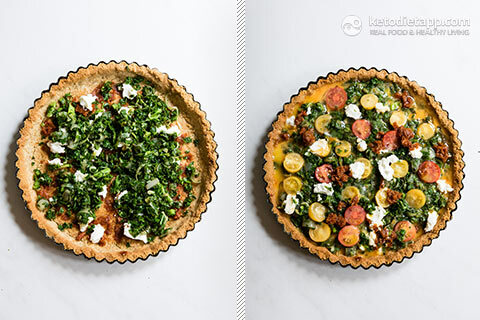 Half the cherry tomatoes and place on top of the kale mix, along with the soft goats cheese. Crack open the eggs in a cup and whisk with a fork. Add a good pic of salt and pepper. Add to the quiche base and top with little dollops of the remaining 1 tablespoon of marinara or red pesto sauce. Bake in the oven for 20 - 25 minutes until the eggs have set. Remove from the oven, allow to cool slightly and top with fresh basil leaves, cracked black pepper and optional baby watercress. Store in the fridge for up to 4 days. This looks so good! Do you think coconut flour would work instead of almond? My partner can't eat almonds, but I think we'd both enjoy this. Hi Natalie, I haven't tried it with coconut flour but if I were to substitute it, I would use less coconut flour and more liquids (add an egg) as coconut flour is a lot more absorbent (I generally use about 1/3 cup coconut flour per cup of almond flour). You may have to try and see what works best as you make the dough. I hope this helps!